After a lot of searching, this was the first telescope I eventually found on sale, and bought, in an antique shop on Jewry Street in Winchester, called Pine Antiques, in May 1992. It was quoted as having belonged to the shop owner and his family: when sold it was brass only, with the barrel, where normally a leather or some other form of covering would be, bare and discoloured with verdigris. But as the first decent brass telescope found, with an engraved maker’s name, I had to buy it. The telescope is a 3 draw brass model, 23” long with a 1.5” dia objective. On the first draw it is engraved “J. Hewitson” and “Newcastle-on-Tyne”. It has a sliding lens cover on both ends, and a sun shade on the objective end. I wrote to the Local Studies Librarian in Newcastle to ask about J Hewitson. They responded that from trade directories he was John Hewitson, an Optician and Instrument Maker, operating there between 1841 and 1858. He had business premises initially in 1841 at 29 Market Street, and in 1847 at 20 Grey Street and 16 Quayside. In later years he traded from 21 and 16 Grey Street. Later, in The Directory of Scientific Instruments by Gloria Clifton, I found Hewitson similarly listed, but as a manufacturer of level instruments and tide gauges, said probably to be the son of John of Rotherhithe, a Mariner. It was also quoted that earlier, in 1828, there was a J Hewitson apprenticed to Joseph Fairey, an instrument maker in London Docks. Since John was said to be the son of a mariner, it is perfectly possible he gained the post with Fairey when visiting London with his father, learned the necessary skills as an apprentice, and then established his business near the docks in Newcastle, where presumably he knew there was an opening amongst the seafarers there. A Google search more recently, in 2017, shows there is an expensive barometer made by Hewitson in Newcastle currently for sale, and also a surveyor’s compass, carrying his name. In a Newcastle Guide book dating from 1846, the Hewitson advert claims to supply Transits, Theodolites, Levels, Surveying & Drawing instruments, Sextants, Quadrants, Compasses, Telescopes, Microscopes and Spectacles & eyeglasses! So possibly he was an agent for various manufacturers. 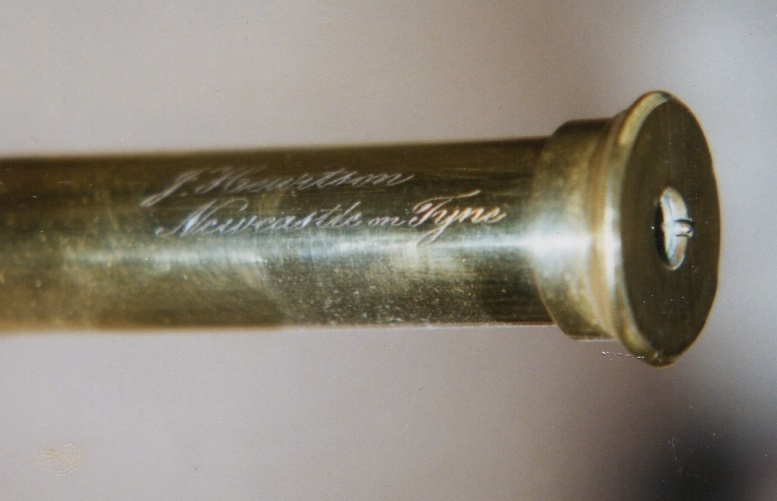 Apart from polishing, the main change made to this telescope was the replacement of the leather cover on the brass barrel. The black leather came from a really good pair of my wife’s boots, with her permission, once they were worn out. The objective is a dual element achromatic pair, and the eyepiece is a 4 lens system, as in the Schyrle-Huygens arrangement, with both sets of lenses in a separate internal cartridge. Where does the telescope fit? Well given his location in Newcastle, and his possible link to the marine industry, the telescope must have been targeted for use on ships and by ship’s masters. Relatively it is quite small, when closed up, but the performance is fine once extended. It is quite unusual compared to many naval telescopes of this early Victorian era, because it is 3 draws, and the eyepiece is a squared-off flat end, similar to the telescope designs of 1790-1820. While it is not anything exceptional, it is still a good, neat telescope from around 1850. It is Accession number 2 in my collection, because I previously bought some binoculars (#1), and my original Enbeeco aluminium telescope bought new in 1960 doesn’t count! The Hewitson is now on sale for £250.